Have you ever taken a moment to think about how your vehicle's tires are made? Probably not, yet doing so may help you better understand what goes into our tire repair service. More than just a few inches of thick rubber, your tires are actually made from layer after layer of fabric cords called plies. These plies sit atop steel belts that help to reinforce both the sidewall and the treads, which is formed from several layers of synthetic rubber. Steel cable loops called beads give the tire the strength needed to stay seated on the rim. Once those components are placed together, they are run through a curing machine which cuts the tread pattern and bonds all the components together. To learn more about tires, including tire repair cost, visit Meineke #1867 in Bloomington, IN today. Keeping your tires in optimal condition is important for a myriad of reasons. First of all, well-maintained tires handle better on slick and uneven surfaces. Their ability to handle these surfaces means that you and your passengers are less likely to be involved in a collision. Tires also have a significant impact on your suspension system, and if they are not rotated periodically, you may have difficulty steering your vehicle. Tires are frequently overlooked by drivers, but the better your tires perform, the better your entire vehicle will perform. Stop by our Bloomington, IN, Meineke #1867 store for a comprehensive inspection today. Uneven tread heights and issues with vehicle stability at high speeds could each be a sign that you're in need of a tire repair or tire change service. However, these signs are often easy to miss. Fortunately, you vehicle will often tell you when its tires need some TLC through your in-dash tire pressure light. If and when it turns on, you should immediately stop and see which of your tires is over or underinflated. 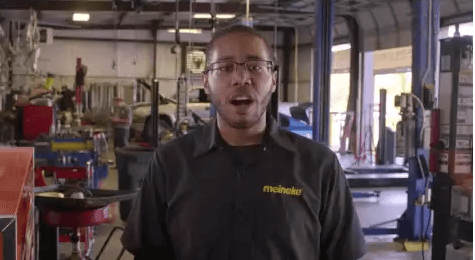 If the sensor continues to illuminate even after adding air to the tire, taking it into Meineke #1867 in Bloomington, IN may help you avoid a high tire replacement cost. Be sure to check and see if you also need a tire pressure sensor replacement while you're there. Neglecting to inspect or replace your tires can be dangerous in the long-run. If your tires are worn down, you may have difficulties handling your vehicle during adverse weather. Sleet, rain, and ice can easily send a vehicle with little tread spinning. During rainstorms, your vehicle will be more susceptible to hydroplaning, and you may experience longer stopping times and distances. Both of these issues have the potential to cause severe injury to drivers and passengers. Naturally, we want to help you avoid such situations. Contact our Bloomington, IN, and Meineke #1867 to schedule a professional inspection of your tires. More than likely, if your tires have not been replaced in over ten years, they will need to be replaced. If you have had your current set of tires for more than five years, professionals recommend having them inspected at least once a year just to be on the safe side. In general, how often you need to replace or inspect your tires will depend on your mileage, driving habits and the road conditions your most frequently encounter. If you constantly drive long distances at high speeds, please remember to schedule an inspection at your local store in Bloomington IN Meineke #1867. Drivers can expect high-quality service from us, but we also understand that tire repair cost and tire replacement cost are important to consider as well. 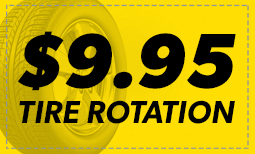 If you are experiencing issues with your steering and suspension, you may also be curious about our tire rotation cost. We realize that vehicle maintenance and repair can be expensive, which is why we strive to offer some of the most affordable prices in the industry to our customers. Your local store may also offer various coupons and discounts. Call our Bloomington, IN, Meineke #1867 store for additional information about our services.